The Appeso Double Towel Hook from Zack. Bring a clean contemporary look to your bathroom via this sleek range of wall mounted brushed steel accessories. Designed by and made exclusively for Zack of Germany each solidly engineered item is built to last and features chic, fuss-free styling that will complement any modern scenario. An ideal choice for those who are short on bathroom space. And because the clean, modern lines of this double towel hook has a timeless quality to them, it is likely to fit in seamlessly with the contemporary bathroom for a long time to come. Double Towel Hook from the Appeso range. 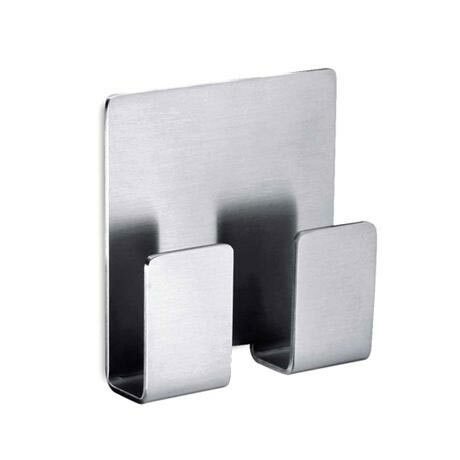 Hi, the Zack Appeso Towel Hook can be fixed to a stainless steel surface. Thanks.